This mattress consists of 3 layers of natural rubber surrounded by Texel pure grow wool, and organic cotton velour . The bottom layer is a firm 3 inch layer. The 2 middle layers are (2) 3 inch layers of your choice of medium, firm, or soft. For the middle layers, you can choose different firmness levels for each of the two sleep zones (queen and king only). 9” total inches of rubber cores inside make this real nice. 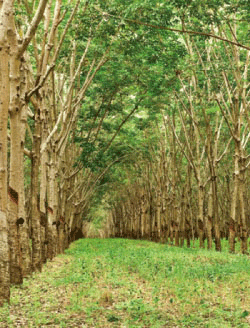 Natural rubber that is adaptable to your and your partners needs. Mold and dust free . Dust mites hate rubber and wool. Moisture pad quilted inside cover along with a lot of wool all over the mattress top, bottom and sides. 3 lbs. per square yard of Texel wool and silk – needle punched and quilted in cover make it very fine. PRICES INCLUDE SHIPPING Latex Comfort Warranty Applicable only 1x within the first year of purchase.One request per customer invoice onlyUp to a maximum of 2 layers of latex in the same request for Full,Queen,King,Cal-King sizes.Proof of Purchase Required.Starting date will be the one on the clients invoice. In Belgium way back in 1985 Georges Lambrecht created Greensleep mattresses, and he was right on. It took over 30 years of research with doctors, engineers and sleep specialists to complete the project, but they did a great job. With this mattress you will have one of the best sleeps you ever had. The Vimala mattress is ergonomic, and it allows the body to complete the 5 sleeping zones, which are incorporated into the cores and result in deep sleep. So its zoned. Green Sleep is more than revolutionary thinking, its a good night’s sleep. Greensleep has found sleep products that redefine the way we rest our mind and body. Yes, Green Sleep is a healthy balance between science, nature and ergonomics. It is a great choice for comfortable, restorative sleep, with cell regeneration on top of all that. Green Sleep has more than 40 years of scientific research, and they were also born of necessity; which means, the better we sleep, the better we feel. That’s because undisturbed sleep restores, and rejuvenates. life is too short to not get the sleep we need everyday. We do spend 1/3 of our life in bed. They designed this mattress to provide the perfect, natural sleep environment, night after night. Give us a call to purchase one of our organic Greensleep mattresses. You wont regret it. Give yourself piece of mind for the next 20 years.